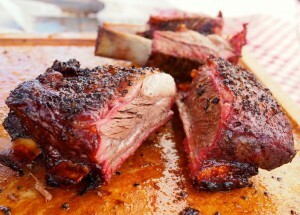 BourbonBlog.com invites you to join us for the 3rd Ever Kentucky State BBQ Festival in Danville, Kentucky this weekend! This will be the best BBQ you will ever taste! The top BBQ pitmasters from across the country will again bring the rare opportunity for you to taste all of the finest Q on the planet. No ticket or entrance fee, just come buy the BBQ from the vendors and this happens September 7-8 in Danville. Plus, BourbonBlog.com will bring our good friend actress Dawn Wells, “Mary Ann” from Gilligan’s Island to the festival on Saturday. She’ll be singing autographs and enjoying some BBQ with the guests. Will she get stuck on the island of BBQ and southern hospitality? What: BBQ Pitmasters all pictured below cooking their specialties (Pork Shoulder, Texas Beef Brisket, Ribs and more). Kentucky State BBQ Festival, the Danville-Boyle County Convention and Visitors Bureau , and Kentucky Bourbon Trail have teamed up to open Grayson’s Tavern at Constitution Square Historic site (the Festival site). The tastings will be available both days of the festival. 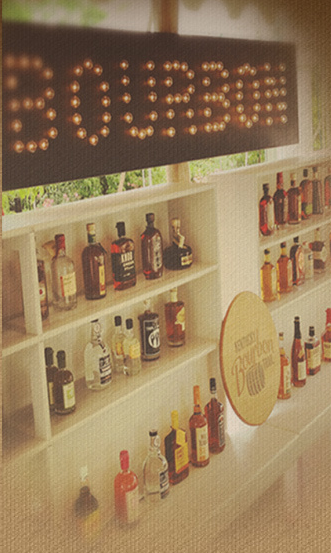 Featuring a cash bar at the same historic location on the centuries old site, Grayson’s Bourbon Tavern will offer almost 20 different brands of Kentucky Bourbon, signature cocktails, opportunities to meet distillers and delicious free BBQ samples. Distilleries including as Jim Beam, Heaven Hill, Maker’s Mark, Wild Turkey, Four Roses, Town Branch, and Woodford Reserve will be represented along with Kentucky Bourbon Trail Craft Tour members Barrel House Distilling Company, Willett, The Old Pogue Distillery, and Limestone Branch. Grayson’s Bourbon Tavern will also offer some ‘throwback’ selections to honor the historic structure built circa 1785. This event offers a unique opportunity to sample your favorite Bourbons and BBQ in the comfort of Grayson’s Tavern, complete with air-conditioning, educational offerings, and all the modern comforts. Price: $10 day passes and $15 weekend passes can be purchased at the door. 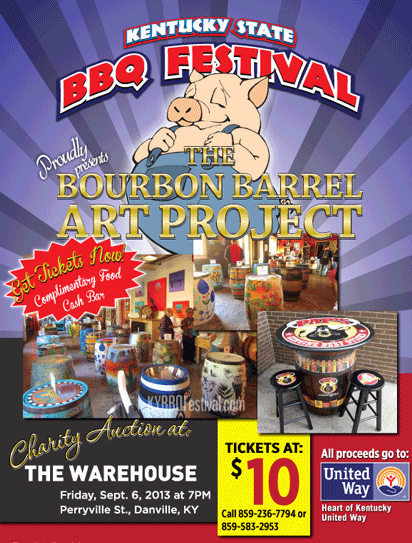 The 2013 Bourbon Barrel Art Project and Auction will be held at 8PM on Friday, September 6, 2013 at the Warehouse on Perryville Road. You can view the barrels beginning at 7PM. Admission is $10 in advance and $15 at the door. There will be complimentary food and a cash bar. The barrels were donated by Four Roses Bourbon and the artists are hard at work trying to top last year’s wonderful barrel art. For more information, see the Bourbon Barrel Art Project and Auction web page.